wraps around the rider's back, down the inside of the thighs, around the horse's belly and over the saddle's girth. This sits the rider in the saddle properly while encouraging the horse's back to lift. 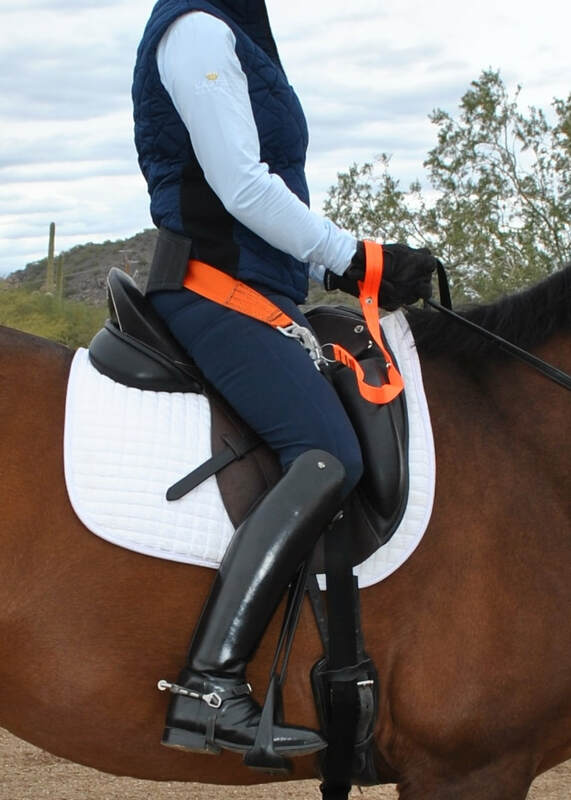 ​The Unisit is fully adjustable and will fit any size rider, saddle or horse. It works on both English saddles and Western saddles. The quick-release safety mechanism is activated with a quick pull of the wrist (or automatically when the rider becomes unbalanced), with the strap that is looped around the rider's wrist. Through muscle memory "imprint" training, the rider will achieve a better seat and ride the horse correctly with open hips, steady legs under the body, a relaxed and supple back, an open upper body, shoulders back with elbows, hands and head in the correct relaxed position and in balance. • A correct seat, the anchoring center of all communications. • An open, supple seat versus a perched, stiff seat. • A seat where the rider is sitting correctly, with the lumbar and inner thigh muscles absorbing the motion of the horse's back. • Clear and more correct aids by allowing the rider to focus on riding versus sitting. Paula Paglia is a nationally recognized horse rider and trainer, with a broad base of knowledge and riding experience. Her professional accomplishments span over thirty years. In 1999 Paula became the head trainer for Dynamite Dressage Stables in Scottsdale, Arizona and holds her USDF Bronze, Silver and Gold medals. Paula also trained and handled the 2004 USDF Cosequin Breeder's Sweepstakes champion mare in the Southwest Series. In 2016 Paula won Arizona State Champion in Third Level, Fourth Level, Open 3rd Level Freestyle and Prix St. George. Also in 2016, Paula was the USDF 3rd Level Champion at the Region 7 Championship in California. Over the past several years many of Paula's students have emerged into the horse world as successful professional riders and trainers. Several Horse of the Year Awards, USDF All Breed Awards, Regional Championship and State Championship titles have been earned under her guidance. Paula has successfully coached Juniors to the North American Young Rider Championships, the Young Rider Championships and the Dressage Seat Medal National Championships. In 1998 Paula coached a group of Juniors which attended the Arabian Youth National Horse Show to four National Championships, two Reserve National Championships and fifteen Top Tens. 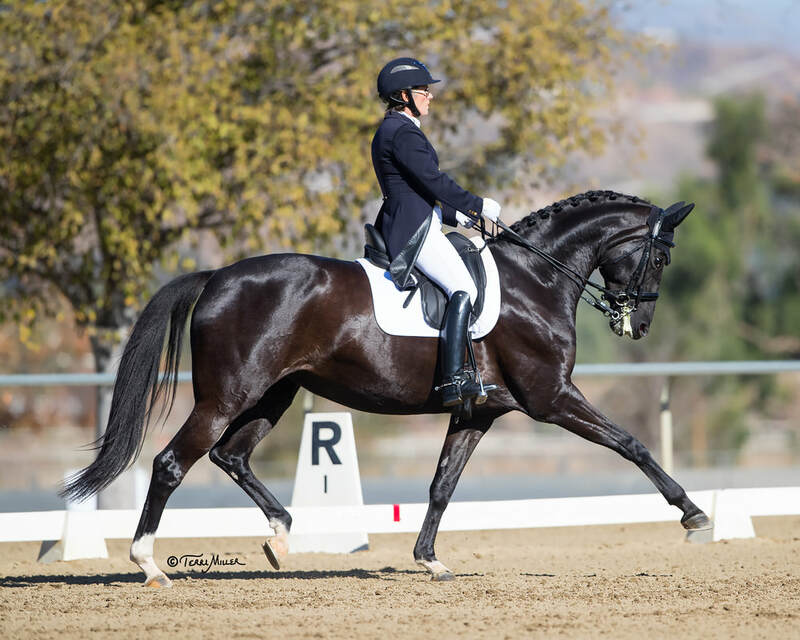 Paula emphasizes a correct classical dressage seat and training, and works tirelessly with her students to develop a correct leg, seat and hand connection. The Unisit Sit Strap System dates back several years when Paula was riding and training for the Grand Prix Level Dressage Competition. In her quest to sit better and learn the demanding movements of this level, her coach fashioned a curious device. Two stirrup leathers were fastened around her, creating a contraption that was promised to help find a more stable and connected seat than ever before. The results were spectacular! Eager to share this newly discovered feel, much time and energy was spent over the next few years developing a Strap that would consistently produce this amazing result; while at the same time incorporating other features to promote safety and comfort. What evolved is the Unisit Sit Strap System. The door has been opened for riders to feel and achieve a correct seat! Today Paula keeps busy coaching riders and horses of all levels, and currently has established her Paula Paglia Dressage program at her 7.5-acre ranch located in sunny Scottsdale, Arizona.